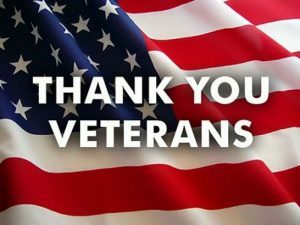 Sunday, 11 November 2018 is Veterans Day and Cyber Tech Cafe would like to extend our utmost gratitude to all of the men and women that have sacrificed so much for our great nation. We encourage everyone to extend their thanks to all of our Veterans and their families for all the sacrifices they have made to keep our country safe. Again, we thank each and every one of you for everything you have done, and Happy Veterans Day!